Notes: 1. 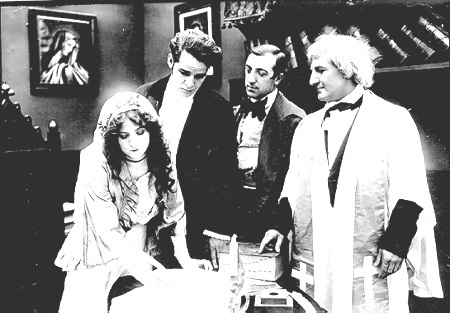 An article in the July 26, 1913 issue of The Moving Picture World erroneously stated that this was a 3-reel film. 2. An expanded story by Ann Ashby, based on the plot of the film, appeared in The Photoplay Magazine, October 1913. BACKGROUND OF THE SCENARIO: Little Dorrit is the tale of the fragile but loving daughter of William Dorrit, who spends much of his life in debtor's prison. When her superficial family inherits a large amount of money and becomes snobbish in their elevated social status, Little Dorrit distinguishes herself by remaining the same sweet girl, caring for an old friend, Clennam, later thrown into the Marshalsea, a debtor's prison. The two fall in love, but cannot marry because of their financial circumstances. Numerous minor characters play significant roles. A mystery concerning Clennam's true mother lends additional interest. The work is from the pen of Charles Dickens (1812-1870), whose biography is discussed under the entry for the film, The Old Curiosity Shop, released on January 20, 1911. It is significant that when Charles Dickens was 12, his father was thrown into the Marshalsea prison for debt, and for a time Charles, his mother, and the younger children lived with him there. "Little Dorrit was born in Marshalsea Prison in London, where debtors were confined years ago. Her father had numerous creditors whose claims had to be satisfied before he could leave the prison's gloomy walls. Her mother died when the child was eight years old, and the girl lived in the Marshalsea with her brother and sister. She was devoted to her family and helped them in many ways. Through her efforts, a dancing master, temporarily imprisoned in the Marshalsea, instructed her sister, Fanny, in the art of dancing. A seamstress taught Little Dorrit how to sew, and the girl, in her new occupation, earned money to buy luxuries for her helpless family. Little Dorrit frequently did sewing for Mrs. Clennam, an elderly widow, and at her home met her son, Arthur, who had just returned from a trip abroad. The young man was strongly attracted by the quiet, self-sacrificing girl, and a strong attachment sprung up between them, but Little Dorrit was loyal to her family, whom she felt was dependent upon her. Arthur Clennam bent every effort to secure the release of Dorrit from the Marshalsea, and succeeded in proving the latter's right to a fortune by a distant relative. The Dorrits, now rich, ignored Arthur, to whom they owed everything, that is, all except Little Dorrit, but her family forced her to go with them to Italy, and become a society personage like themselves. "Wealth did not bring happiness to the Dorrits. Little Dorrit was as unaffected as ever, but her family was pursebound arrogant. Her father was stricken at a banquet and died soon after, believing that he was once more a prisoner in the Marshalsea. Little Dorrit, now free, received word that Arthur Clennam had lost his fortune and was a prisoner himself in the Marshalsea. She went to him and comforted him in his hour of trial. Fortune smiled upon them, and Arthur soon was able to pay his debts and leave the Marshalsea forever, with his bride, Little Dorrit, the child of the Marshalsea." "That Charles Dickens, the creator of 'Little Dorrit' and the group of quaint and grotesque characters that accompany her through the weavings of the story of his imagination, would be pleased with its presentation in film by the Thanhouser Company, with Maude Fealy playing a graceful lead, there can be no doubt. What impresses itself most vividly on the mind when the two reels of the picture have reached their limit and Little Dorrit has emerged from the church, where she was christened as a bride, is that the production has fallen short in the matter of composition very little, if any; that the true Dickens atmosphere is there, and that the general characterization has been accomplished remarkably well. Maude Fealy, in the role of Little Dorrit, is just as fresh and dainty and quite as old-fashioned, clothed with a simple grace, as if she had just stepped from a thumb-worn volume of the master character painter. James Cruze, as old man Dorrit, has to the casual observer's knowledge not made one misstep, while William Russell is all that could be desired as Arthur Clennam. The production is of such merit that it could safely be used for educational purposes, as well as for entertainment in the theatre." REVIEW, The Moving Picture World, August 9, 1913: This review is reprinted in the narrative section of the present work. "Not to be classed with The Snare of Fate and the beautiful story of the blind princess recently released by the same company. I saw the first applauded generously by a large audience at the Wadsworth and learned that the latter had been the subject of much favorable comment in another audience, one lady remarking, as she left the theatre, that it was the most beautiful play ever shown on the screen. Little Dorrit is produced with care and good taste, but that and the title constitutes nearly the sum of its values. The novel is really a satire in English Civil Service as represented by the Circum Locution Office long ago. The motive is of other days. So is the debtors' prison as occupied by the Father of the Marshalsea, Little Dorrit's father. Her simple story is really one of a tangled minor interest so far as the original work is concerned. As portrayed on the screen it shows her eventless birth and growth in the prison, her work as a seamstress, her devotion to her father while he lived, and her marriage to Clennam. The enormous amount of space devoted to showing that her character was an unselfish one is almost destitute of dramatic action, and tension is nowhere visible. "Director and actors have done their best to make the Little Dorrit adaptation interesting. There is nothing to be accomplished by singling them out - they have made the most of their opportunities - for they can all do better. Put the spirit of Dickens into a play of today, and to problems of the hour, burning questions that quickly light the flame of human emotion. Charles Dickens was essentially the defender of the humble. He illustrated over and over again that to be illustrious was nothing; to be merely useful was not enough. We must reach out into the hearts of others and live their thoughts and feelings in order to appreciate the full meaning of existence. Use the spirit of Dickens in a modern play." "Little Dorrit, born in the Marshalsea prison for debtors, child of the turnkey, grows up a favorite of all inmates. In her teens she becomes a seamstress for Mrs. Clennam, who lives nearby in London. She loves and is loved by this lady's son, Arthur. He discovers in some way that a fortune belongs to her, and assists her to get it. Now having a position, she leaves the Marshalsea and goes to Italy under the tutelage of Mrs. Governor, a stern old dragon who sets her cap at Little Dorrit's father. Fortunately the father, now on his dotage, dies before this match can be consummated. He used, by the way, to shame his daughter in fine company by telling of her lowly place of birth. She now returns home, visits the Marshalsea, finds Arthur Clennam there, ill and a prisoner. He is freed and she marries him. This version of the famous Dickens story is exceedingly pretty, and has caught the necessary atmosphere well. It is very tame, however, being more intent on the story itself than on the incidental suspense that is so important to part of the great novelist's work. The first reel of the two is almost wholly occupied with giving exposition and preparatory scenes that have most of their value in the future and little in the present. The necessary tenseness might have been supplied by showing how Arthur found and gained her fortune for her and how he came to be a prisoner. The story, it will be remembered, is in two books. Maude Fealy, is a delightful Dorrit. William Russell is a fine Arthur, and James Cruze played the father artistically and with feeling."